A frittata is an easy one pan comfort meal where the ingredients can usually be found in your fridge, your garden, and if you are lucky, from your henhouse. I used to get confused between a frittata and a tortilla. What is the difference? Well, not a lot. They both originate in Europe with the Tortilla from Spain and the Frittata from Italy. 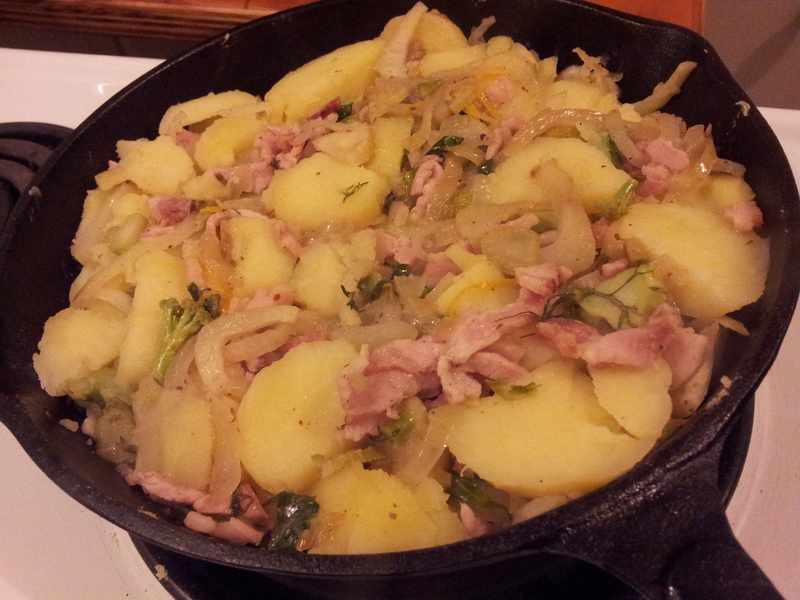 Both feature eggs and potato. The Spanish tortilla is really a potato pancake made mainly from finely cubed or grated raw potato with 1-2 eggs. Like a pancake its flipped to brown both sides. 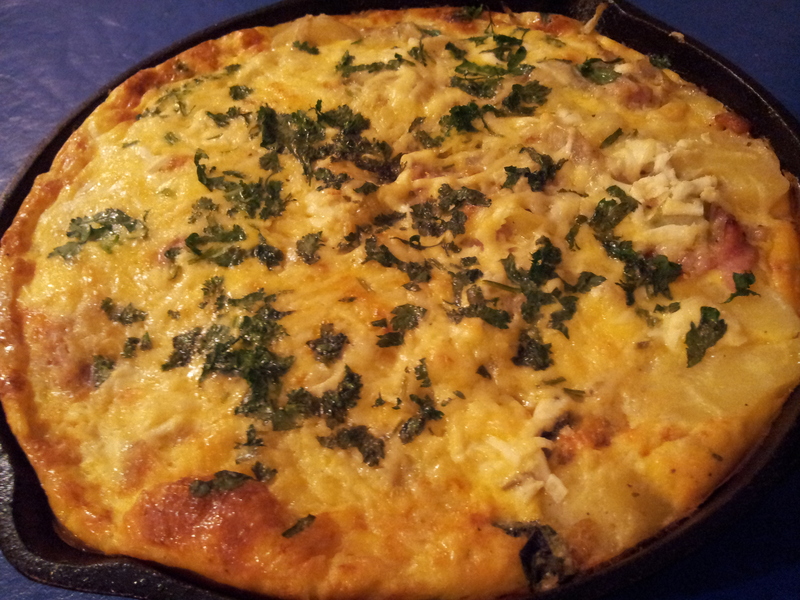 The Italian frittata uses a lot more eggs and usually contains cooked potatoes, but can have alternative vegetables. Like the tortilla it is cooked on the stovetop but is finished off under the grill in the oven. 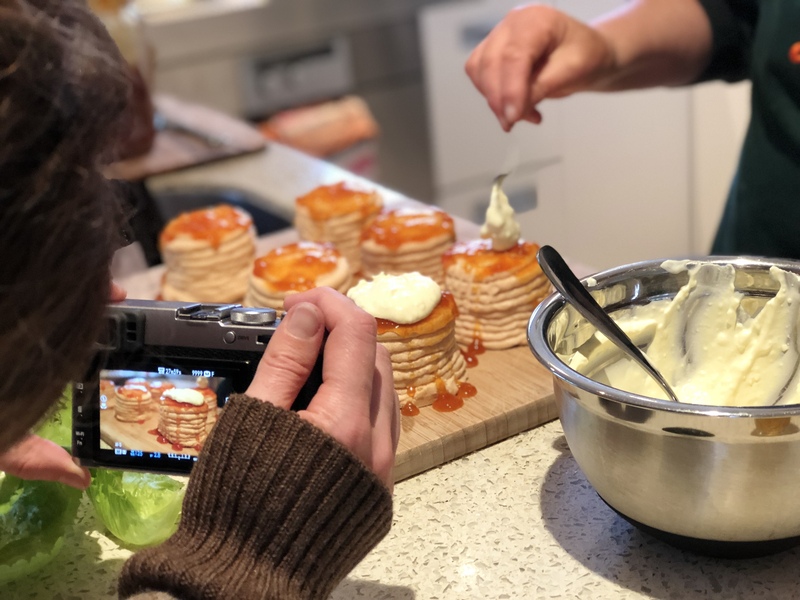 In July I was staying with my sister Kerry in Dunedin and had planned a visit to the wonderful Otago Farmers Market to gather some local treats for our dinner. Saturday morning arrived with a storm. We took one look at the weather and decided to forgo the market and stay put by the fire. I declared I could make something delicious from the stores available in the kitchen and garden. Kerry has hens so where there are eggs there’s a meal in the house. 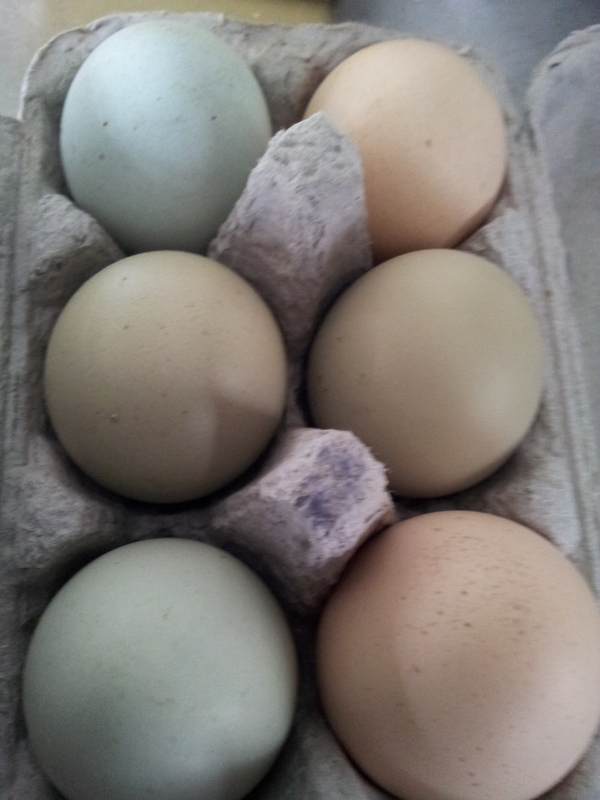 Kerry’s hens lay eggs with beautiful coloured eggshells from duck egg blue to khaki. 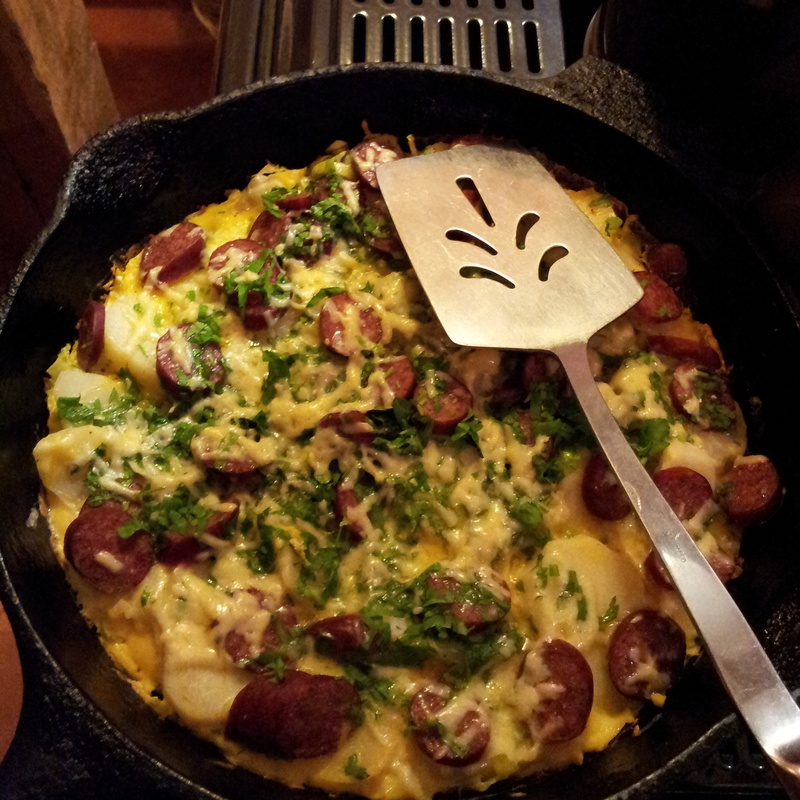 Both tortilla and frittata produce the best results in a heavy weight pan, preferably cast iron. Kerry is the proud caretaker of the Hayden skillet. Peter’s mother from Napier gifted us the skillet and she may not have realised that the skillet was returning back home to the south. 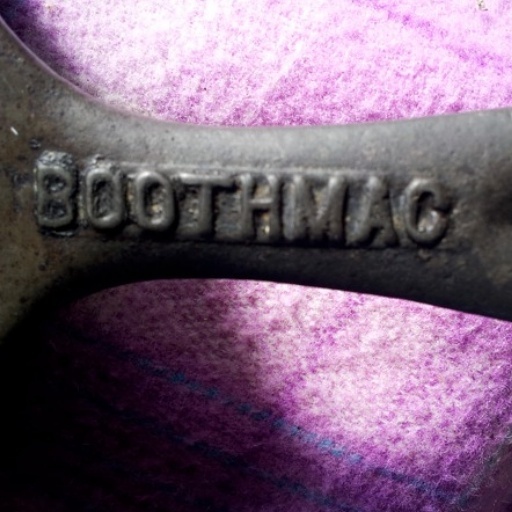 I’ve discovered it was made in the Booth MacDonald foundry in Christchurch. My son Gus is a chef and appreciates cast iron or heavy steel pans and has appointed Kerry and I to hunt out and buy any good cookware on our excursions to Dunedin’s opportunity and second hand shops. One of our favourite stops is the Hospice Op shop in the old part of the city (block behind Mojo coffee on Princes Street). I couldn’t believe my luck when I saw another Hayden skillet that I would get for Gus. The Hayden skillet bears the name Boothmac – Booth MacDonald foundry also made grenade bodies for use in World War II. But Boothmac is probably most famous for manufacturing farm water pumps and no doubt some are still pumping water around farms in NZ. This is not so much a recipe as some guidelines, as you can use whatever ingredients you have on hand and the number of eggs will depend on the size of the finished frittata. 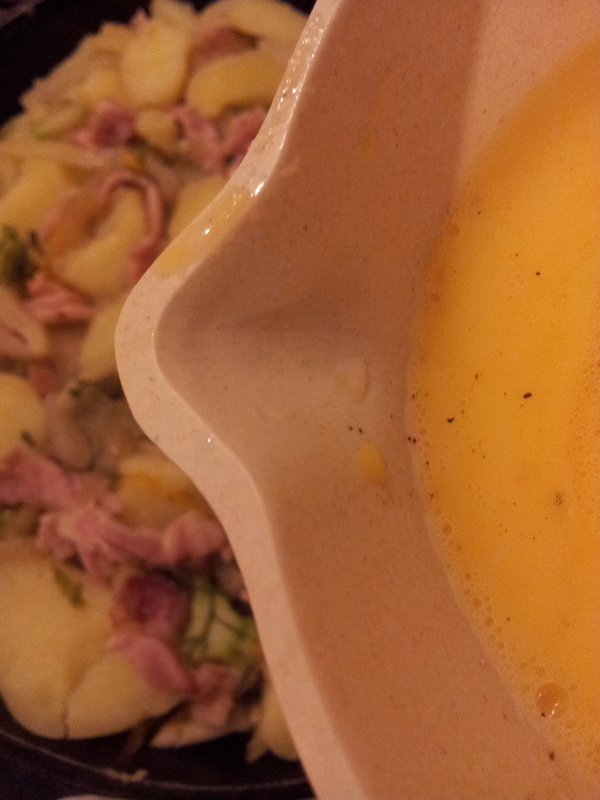 Its an easy throw together recipe and quick to make, especially if you have cooked potatoes on hand. As you need cooked potatoes, you can do this earlier in the day or ideally preparing for a previous night’s meal you boil an extra few for the frittata. I tend to use at least half a dozen medium potatoes. Potatoes give the recipe that comfort food feeling but you could replace the potatoes with kumara or pumpkin. I have also seen recipes where you use broad beans. 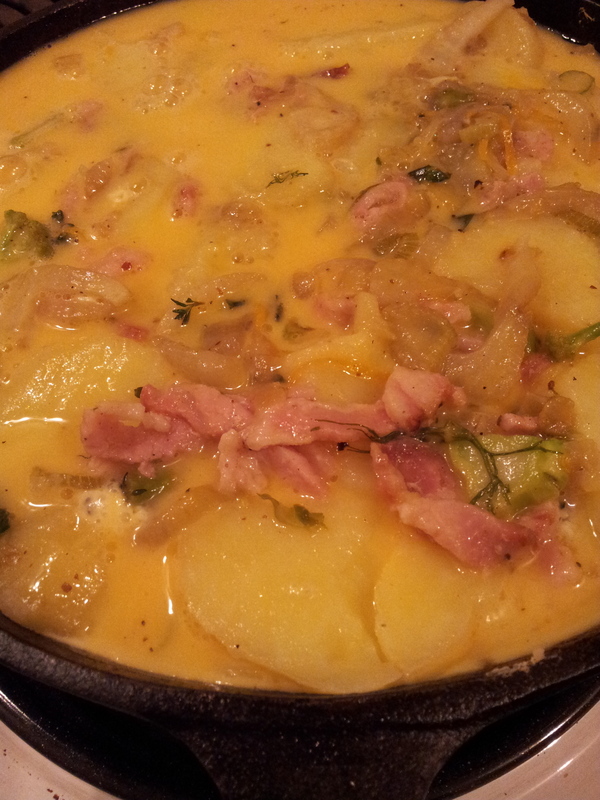 Again the number of potatoes and added vegetables will depend on the size of the frittata. Next I sauté the other vegetables that will give the frittata more flavour. Gently sauté one chopped onion until translucent. 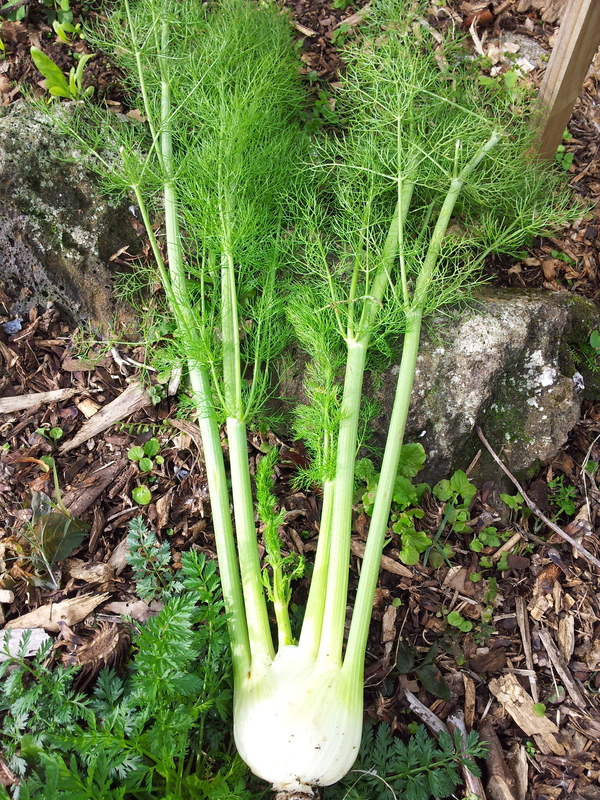 Add either chopped celery or as I had available from Kerry’s garden a fennel bulb thinly sliced. Use whatever you have available. Bulb fennel is a delicious addition but celery is also good. Next finely chop and squash 1-2 cloves of garlic and add to the pan. This dish is perfectly delicious vegetarian but I do like to finely chop a rash of bacon if I have some, or as we had in Kerry’s fridge a cooked chorizo sausage. I also like to add a little lemon zest or you could use a touch of preserved lemon just to add that fresh citrus flavour. Now your Frittata is ready for the eggs. Either add potato and move the sautéed vegetables around or if you like it more organised, put the sautéd vegetables into a dish and sprinkle over layers of placed potato slices. Make sure you have a slurp of oil in the bottom of the pan so that it doesn’t stick too much. At this point you could also add other vegetables you have on hand like cauliflower or broccoli. If you are adding beet or spinach you will need wilt and cut up before adding. The egg is now added to act as a binder for the vegetables. Whisk 5-8 eggs depending what you have available and what size your pan is. Kerry’s hens were still off the lay so the most I could use were 4 eggs. Season the egg with salt and pepper and if you only have 4 or 5 eggs then you could add a little water (like an omelette just 1-2 tbsp of water per egg). You can also use milk but I like to think of this dish more as a omelette than a quiche. Gently pour the eggs to fill in the gaps and cook gently on the stove top until the egg is nearly set. When the egg has started to set but there is still some liquid on top, that is when you add cheese and herbs and place under the grill. Meanwhile heat up the grill of your oven, grate on some cheese and chopped herbs and put under the grill for about 5 minutes or until fully set and a golden crust. Keep on eye on the oven at this stage because you can quickly burn the top under the grill. When Frittata is set and golden on top it’s ready to serve. The frittata was a simpler meal than it would have been had we gone to the market but it was just perfect for the weather. 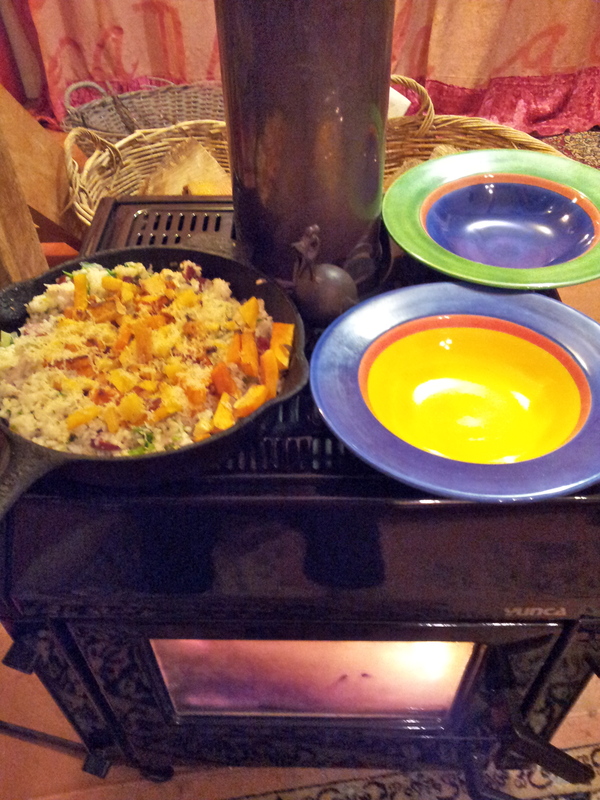 The burner warmed our plates and kept the frittata hot until we were ready to eat in front of the fire. Being an inside day I took the opportunity to learn about Instagram from Kerry. Instagram is a mobile phone app that allows me to share images. You can find me on Instagram on @Jeannieskitchen. I have also taken up the 100 Days Project Challenge where each day for 100 days I enter an image and a possible future blog subject. 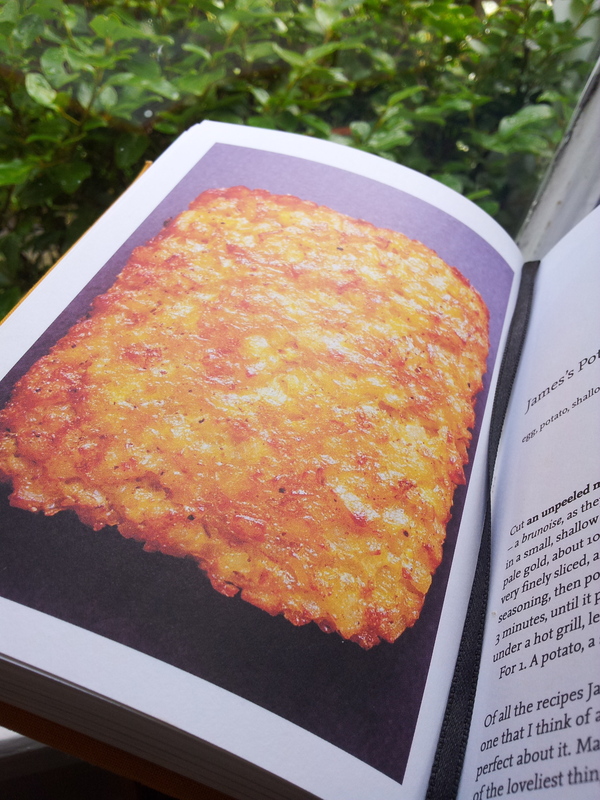 I have called it Food Triggers and you can find me on 100 Days Project – Jeannie.